Little did I know that when I was accepted for a gallery exhibition 6 months ago, that the time would come so quickly, and here it is only a few weeks away. Getting ready for a show is, without a doubt is MUCHO WORK. First is the task of selecting your artwork. What would you like to show? 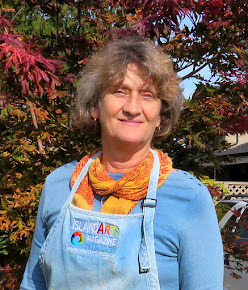 Are you showing a series, working on a theme, newer work, medium, etc. This usually involves taking everything off your walls, collecting your work from other locations, sorting through boxes of art that has been shoved under the bed and in the closets, and selecting the pieces. Selection usually takes me a full day. I find a rainy Sunday works well for this. Now that the house and studio are totally ripped apart, the task of examining each piece comes next. Are the backs of each piece clearly marked? Are they framed property; no loose wires, no scratches etc. Have you signed the backs of each piece? I started doing this a couple of years ago and quite like this practice. I even put the title and a copyrite on the back as well for authenticity. Once that is done, then the never ending paperwork begins. I start by making a list of the pieces for the show, the sizes and the price. Make sure all your records are the same. Does the price on your gallery/store coincide with your final price for the show? Next comes the making of a press release which is to be emailed out to the newspapers. Some galleries will ask for this so they can send out a press release in their own area. Even though you SHOULD already have one on hand, there is always last minute updates to be made. Now what about advertising? Are you running any ads in the local papers, making posters, etc. There are many free listings available on art related website. All this takes time and effort. But don't despair, we are almost there! Once that is done, then you should think about invitations. Are you mailing individual invitations, are you doing an email blast ... how are you letting your patrons and friends know that there even is a show? Are you totally exhausted yet but still plan on finishing a couple of pieces for the show? At some point you will have everything in place and under control and at this point you ... simply let it all go and stop worrying, as you know you have done your very best! I actually LOVE having gallery exhibitions and try to have a couple a year. They are a Heck of a Lot of Fun! They are important to do as it gets your name out there and often into a whole different area then you are use to. There is always some good things come from a show, whether it is new contacts, an opportunity down the road ... and possibly new sales or commissions. 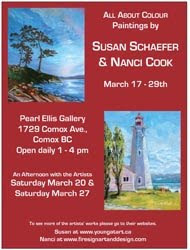 That being said ... please join me with fellow artist Nanci Cook on March 20th at the Pearl Ellis Gallery in Comox for our "Meet and Greet". Hmmm ... that reminds me, was I suppose to bring the coffee?